Strange as it may seem to those who are not familiar with the niceties of English etymology, dream is not only a word of questionable origin but also a word whose recorded history in Germanic contains a major riddle. However, before presenting this riddle, I would like to repeat what I have said about such matters more than once. From the etymological point of view, some words are indeed hopeless; that is, we do not know enough to suggest reasonable conclusions about their derivation. But it may happen that good conjectures (given the information at our disposal) exist, and one wonders why the most authoritative dictionaries balk at adopting them. Do those conjectures remain unknown to lexicographers (dictionary makers)? This is unlikely. More probably, few editors have the boldness to publish solutions that are not fully secure. James A. H. Murray, Walter W. Skeat, and Friedrich Kluge, to mention only those scholars to whom I constantly refer in this blog (and this list is most incomplete), did not fear losing face and offered many controversial hypotheses and later kept defending or modifying them. Be that as it may, some details in the development of the Germanic word for “dream” seem to have been clarified, even though they are not a hundred percent certain and though dictionaries prefer to ignore them. Goya’s etching “The Sleep of Reason Produces Monsters” is probably the best-known depiction of a nightmare in art. The Old English word for “dream” could also refer to such demonic visions. 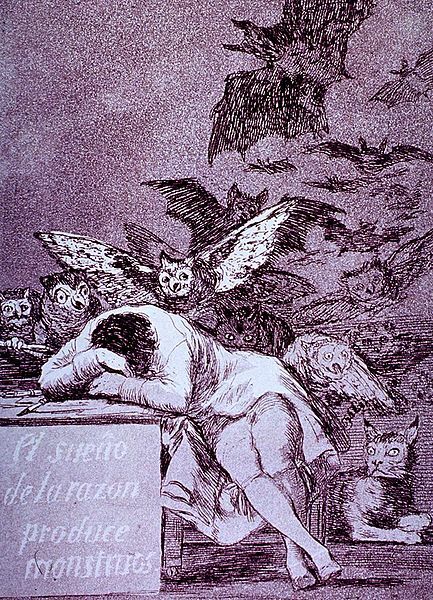 Image credit: El sueño de la razón produce monstruos by Francisco Goya. Public domain via Wikimedia Commons. The forms of our word in the Old Germanic texts are as follows. Note only the senses, for all the sound correspondence are regular: dr-m and a long vowel in the middle. It is natural to begin with Old English: drēam “joy, gladness, delight, ecstasy, din, mirth, rejoicing; melody, music, song, singing.” Those glosses have been culled by language historians from the texts in which drēam occurs and are therefore open to interpretation. Perhaps the common denominator of all that joy and singing is noise. On the other hand, “jubilation” may be the underlying concept. Anyway, nothing in the Old English texts reminds us of sleep and dreaming, and this is the root of the trouble. By contrast, Old Icelandic draumr and Old High German troum meant only “dream” (no noise, no joy). Modern Icelandic draumur, German Traum, and Dutch droom mean the same. In English, dream “a vision during sleep” did not surface in texts before the thirteenth century, and it has been suggested that the word is a borrowing from Scandinavian: allegedly, it either supplanted the native sense of dream or influenced its meaning. Yet it remains unclear whether “noise, din” (or “merriment, jubilation”) and “nightly vision,” the senses recorded in the oldest period, are at all compatible. 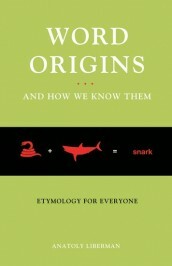 Many researchers believe that we are dealing with unrelated homonyms. The Berlin Heliand. 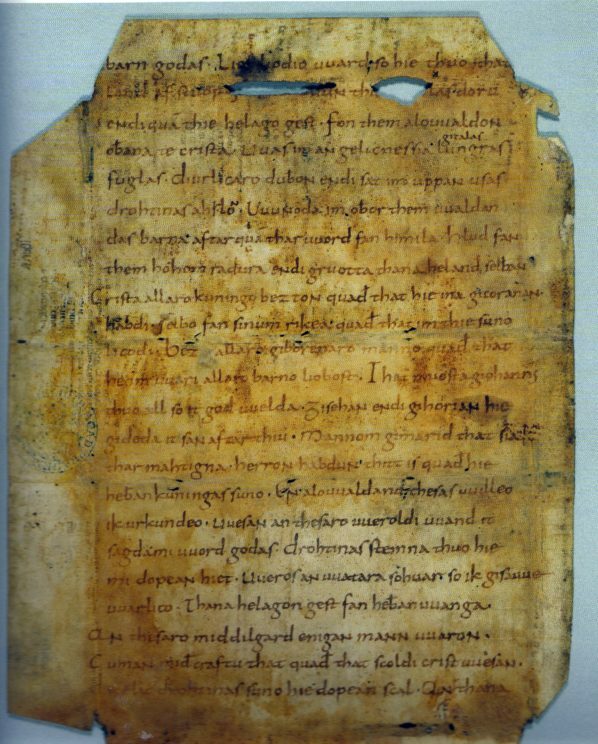 Image credit: Heliand fragment circa 850. Public Domain via Wikimedia Commons. “Life on this earth.” It is far from clear how this sense developed. Perhaps the following hypothesis has some value. In Old Germanic, “earthly life” referred to “joy,” with the accent on “joyful existence in the din of communal living.” Modern people’s desire for privacy and quiet was alien to those who lived two millennia before us and even quite some time later. The pre-Christian Germanic concept of life (communal life!) stressed the temporary blessings of our short stay on earth among relatives and allies, rather than an expectation of eternal bliss in heaven. In the mead hall, people drank, made merry, and one of the many ways to express their happiness was to laugh. Medieval laughter had nothing to do with humor as we understand it; it expressed deep satisfaction, be it at the sight of a vanquished enemy or of belonging to the retinue of the king, the ring-giver. When Beowulf, the hero of a famous Old English poem, died, it is said that he gave up laughter. The Old Icelandic phrase the abode of laughter meant “breast.” (In my book In Prayer and Laughter, I said all I know about this subject and won’t enlarge on it here.) In the Old Saxon Heliand, one finds an analog of the English phrase. When Herod died, we read, he gave up drōm. Other instances of this usage occur elsewhere. Apparently, drōm denoted earthly existence, viewed as a blessing and something worthy of having. The previous two points would not have been worthy of mention if, in the Heliand, drōm had not also occurred with the sense of “dream.” This is what happened to Joseph: an angel came to him an drōma, that is, in a dream. Two more occurrences of this drōm show that this usage was normal in Old Saxon. I’ll quote only the last of them, because it is almost identical with the one we have just seen: fon them drōma ansprang Ioseph “Joseph jumped up from that dream” (this sentence occurs in the episode “The Flight to Egypt”). An angel appears to Joseph in a dream. 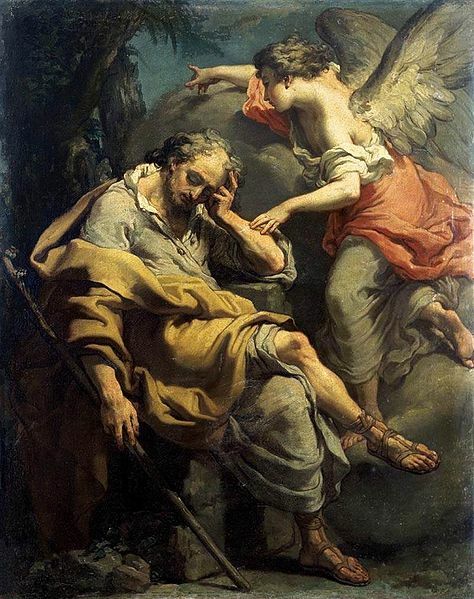 Image credit: Joseph’s Dream by Gaetano Gandolfi, c. 1790. Public Domain via Wikimedia Commons. The conclusion is obvious: the word whose modern reflex (continuation) is Engl. dream could occur in one Old Germanic language with two senses: “life” (“joyful existence,” “earthly life,” or “life anywhere,” depending on the context) and “dream,” and it is our task to understand how this blend could develop. Are we witnessing two homonyms or one word with two seemingly incompatible meanings? And here I would like to return to the beginning of the present post. The literature on the history of “dream” is huge, but, on consulting it, one sometimes gets the impression that etymologists have no way of answering the question asked above and are stuck in limbo. I am convinced that no limbo exists, even though the way out of it is neither broad nor straight. To be continued until light and drōm appear at the end of the tunnel. Featured image credit: The wedding at Cana by Jan Cossiers. Public domain via Wikimedia Commons. The Greek “dromos” (also attested in ancient Greek) may be relevant here. It can mean “one’s life goal, asperation, dream”. It generally means “life path, toil, way”. With a sense of “fatefulness”. It now also means “street”. Possibly from Greek “odos” (street). As for “joy”, clearly from Greek “zoy” (life). Hello Yves! Don’t OD on LOL! The Greek “dromos” is attested in Homer. When describing Odysseus not finding his way back (“dromos”) to Ithaka. Such use of “dromos” is not describing a physical road (also “dromos”). But a longing, a goal, a “dream”. Much in the same way “dream” is used in “dreaming of a white Christmas”, or “dreaming of riches”, etc. The Greek word “dromos” has taken various metaphorical meanings to describe “path of life”, “toil”, “fate”, “asperation”, “way”, etc. It is possible in its English manifestation to have evolved into “dream”. We know (or should know!) many ordinary English words have Greek roots. “Dream” may be one of them. “Fuss” may be another! As also “egg” and “squirrel”.